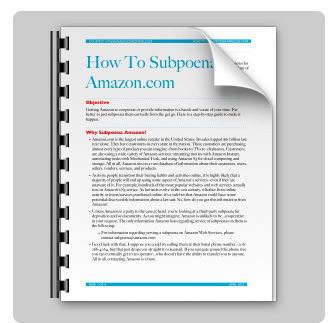 Want to learn how to subpoena Amazon? Amazon.com is the largest online retailer in the United States. Its sales topped $61 billion last year alone. They have customers in every state in the nation. These customers are purchasing almost every type of product you can imagine – from books to TVs to chainsaws. Customers are also using a wide variety of Amazon services: streaming movies with Amazon Prime, automating tasks with Mechanical Turk, and using Amazon S3 for cloud computing and storage. All in all, Amazon sits on a vast database of information about their customers, users, sellers, vendors, services, and products. Furthermore, as more people transition their buying habits and activities online, it is highly likely that a majority of people will end up using some aspect of Amazon’s services – even if they are unaware of it. There are also millions of user generated user reviews on Amazon. If a lawsuit is related in any way to a tangible product, there is a fair chance that it was reviewed on Amazon. Hundreds of the most popular websites and web services actually run on Amazon’s S3 service. As lawsuits evolve in the 21st century, whether from online activity or items/services purchased online, it’s a safe bet that Amazon could have some potential discoverable information about a lawsuit. So, how do you get this information from Amazon? Good luck with that. I suppose you could try calling them at their listed phone number, (206) 266-4064, but that just drops you straight to voicemail. If you navigate around the phone tree you can eventually get to an operator…who doesn’t have the ability to transfer you to anyone. All in all, contacting Amazon is a bust. I’ve actually subpoenaed Amazon. It’s a rigorous process. I detail it, along with all types of other social media discovery issues in the below guide. It’s yours – free.